As a result, Namingway Edition suffers the same problem, but it's not as bad as J2e blatantly making things up. You can't go wrong either way, really. Sounds good, I do seem to have a problem getting the game to load though. I downloaded the latest version from here and patched it to the Rom stated that would work and when I go to load it into Snes9X, It just sits with a black screen. I will try a couple more things as I am sure it's probably something on my end during the patch process. But thought I would mention it just in case. You're using Lunar IPS with a headered v1.1 ROM, right? Let me look into it. Edit - I applied it to a headered v1.1 ROM with Lunar IPS and the game works fine. I think it might be something on your end, then. Did you use a different patcher, or an unheadered ROM maybe? I'll try again, I checked and I am using Lunar. It has the Moon on the Icon. It probably has something to do with the headered part since at the time I was patching both this one and the namingway version which requires no header. I may have gotten the originals mixed up. I'll give it another shot in a moment. Alrighty! You can use TUSH to easily add or remove an SNES header. I finally got it to work. Did a lot of trial and error. The (!) symbol was hard to find in a Rom but at last I found one. It had come to my attention that Namingway Edition's renaming menu was broken, so I checked Project II--it was broken there as well. That is to say, the cursor was invisible and it was difficult to navigate the menu. 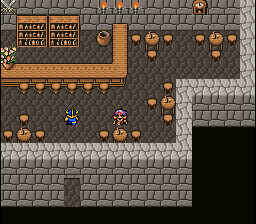 This has been fixed in v2.21, and I renamed Cid's daughter again--Hilda, an FFII reference. I figured this was more appropriate. v2.21 is live on RHDN. http://www.romhacking.net/hacks/1659/ Grab it there. Edit 1 - I'm aware that I forgot to update the version number on the site page, but when you go to download it, you will be getting v2.21. Players of Namingway Edition, as soon as Rodimus finds the time, he'll be releasing a fixed version of his mod with the renaming menu fixed. Edit 2 - Version number is changed, for those who care. Edit - I'm aware that I forgot to update the version number on the site page, but when you go to download it, you will be getting v2.21. Yeah, I've got to get to it this week. Got back from NYCC and I have a long list of things to get to! Good old New York City City. New York Comic Con actually. Was a fun week, but exhausting. Hello, it's me again, the guy who wanted to translate this mod to Brazilian Portuguese. Well, we ran into some problems using our own text dumper/inserter, and if there is any way you could send the one you are using, we'd very much appreciate it. Been a while, but 2.30 is out. There have also been documentation updates. OK, some of you may have been following FFIV: Namingway Edition's thread, and seen that a large update is incoming. ChickenKnife supplied Rodimus and me some rather excellent suggestions to refine my 6-year-old writing, and it's come to my attention that much of Project II's script has needed smoothing over. v2.40 is going to arrive before February, with a wide swath of tweaks to the script. Spooniest is playtesting the game at the moment to ensure quality. Ladies and Gemma Knights, Final Fantasy IV, Project II. Nice work. I'm currently play testing Namingway Edition myself right now. Thanks for the heads up with the dramatic music stops. Um, did a meme creeep into the new version's script lines? Because there's a review that says it's now full of memes. I'm not sure what to think of new memes in the script, honestly. I haven't had the time to play Namingway or P2's recent script update yet, for the record.